Experience the beautiful interior of the Norwegian Breakaway and enjoy a relaxing cruise. A destination itself, the hugely popular Norwegian Breakaway offers a fabulous range of dining and entertainment options, including rich buffets, exquisite specialty dining restaurants, exciting live cooking events and mind-blowing Broadway spectaculars such as The Rock of Ages and Burn the Floor. The Jazz and Blues club offers relaxed live music and expertly-crafted cocktails when the sun goes down, with the Second City Comedy Club providing your daily dose of laughter. Fun for the whole family, the Norwegian Breakaway provides a fantastic range of age-appropriate activities and play zones for children and teens to enjoy, such as the Splash Academy and Entourage. 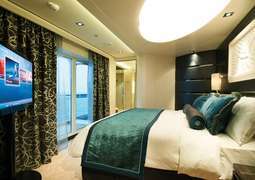 Enjoy your dream cruise vacation to the Caribbean or Europe in a range of comfortable, stylish staterooms and Suites on board the Norwegian Breakaway. 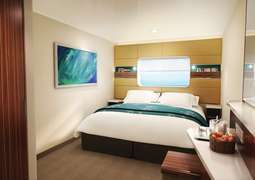 Whether you are cruising solo or with a partner, friends or family, there is a stateroom on board the Norwegian Breakaway to suit every taste and budget. For those after an exclusive, indulgent experience, The Haven Suites provide a particularly luxurious stay. The Norwegian Breakaway is a foodie’s paradise. A variety of superb dining experiences await, like the authentic Brazilian-style steakhouse Moderno Churrascaria, Tuscan specialty restaurant La Cucina or Le Bistro French Restaurant – ooh la la! Sample the freshest sushi and sashimi at Wasabi, delectable seafood at The Raw Bar, or indulge in authentic gelato at The Waterfront’s Dolce Gelato. Norwegian Cruise Line is renowned for exciting entertainment and world-class facilities. A playground for adults awaits you on board the Norwegian Breakaway, where you can enjoy award-winning Broadway shows like smash-hit Cirque Dreams Jungle Fantasy, Wine Lovers The Musical and the sizzling Burn the Floor extravaganza. There’s plenty for the kids, too – the Splash Academy, Entourage, Kid’s Aqua Park and child care service make the Norwegian Breakaway fun for the whole family. Relax and rejuvenate the Norwegian Breakaway’s on-board fitness and wellness amenities. Stay in shape at the fully-equipped Pulse Fitness Center or indulge in a pampering spa experience. The 3,963-passenger vessel is currently operated by Norwegian Cruise Line and is an innovative and top-quality vessel. Norwegian Breakaway is a cruise ship which was designed with freestyle cruising in mind. 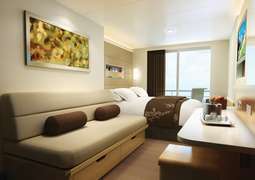 She offers a great atmosphere, wide range of activities, a slew of restaurants and comfortable staterooms and suites. Discover the awe-inspiring places visited by the Norwegian Breakaway, including the Bahamas and the Caribbean. Stroll along one of the ship’s decks enjoy a refreshing cocktail by the pool or marvel at the most beautiful vistas from the magnificent Norwegian Breakaway Suite. Wherever you turn aboard the Breakaway, you will discover something new and breath-taking. Noted for top-quality entertainment and emphasis on health and fitness facilities, Norwegian Breakaway combines action, activities and fun in a casual, free-flowing atmosphere. 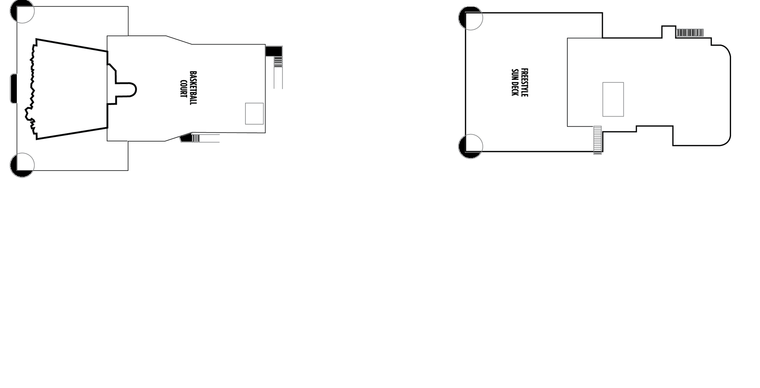 The ship’s 3-deck Atrium is abuzz with action throughout the day and night. The casino is massive, and activities for children and teens are endless including five multi-story water slides and 9-hole mini golf course. Take a dip in the pool, visit thermal suite and try out our lovely steam rooms or heated tile loungers, or simply get a hot stone massage at Mandara Spa. Norwegian Breakaway offers a wide range of pleasant treatments to rejuvenate you. With many different dining options from traditional cuisine to Spanish tapas, dining aboard Norwegian Breakaway is an experience unlike anything else at sea. The Manhattan Room main dining venue offers an intimate atmosphere with panoramic ocean views from two-story, floor-to-ceiling windows. Spacious and elegant restaurant facilities provide the perfect venue to start the day, meet new people, and enjoy delicious meals including five-course dinners. Enjoy comfort foods as well as more exotic choices from many specialty dining options aboard Norwegian Breakaway. You are guaranteed to find everything you need for a successful cruise holiday in the many styles of staterooms onboard the Norwegian Breakaway. 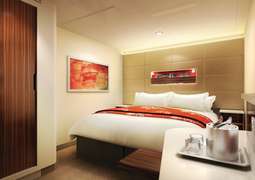 All cabins are enhanced by stylish touches and decorated in a pleasingly modern style. All suites include large balconies that come with wonderful ocean views.